Pork loin ribs are great for a weeknight meal or a casual Sunday dinner, because they are easy to make. They are also versatile in that they can be made with various flavors. This particular one takes on an Asian flare. 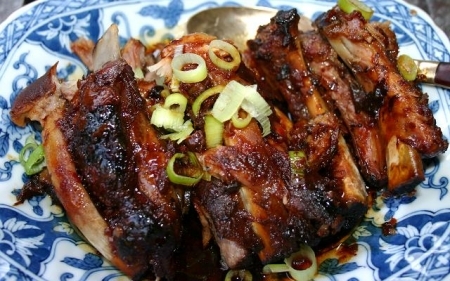 The ribs used had eight ribs, and will serve two for a heartier appetite or four for a lighter appetite. Adjust ingredient amounts to accommodate the number of people serving. If you are adding more, you may need to cook longer. Spray a small Dutch oven, Le Creuset pot or other large pot with non-stick cooking spray. Place ribs flesh side down into pot. Sprinkle with kosher salt. Evenly spread the remaining ingredients over the top of the ribs. Cover and bake in a preheated oven at 300 degrees for two hours or until meat easily falls off the bones. Try Asian Style Rice or Chilled Soba Noodles with Mandarin Oranges. Try Sapporo, Tsingtao, Blue Moon Belgian Style Wheat Ale with orange wedges, Souverain Sauvignon Blanc (Alexander Valley, California) or Root:1™ The Original Ungrafted Sauvignon Blanc (Casablanca Valley, Chili).